Shoestring is a British drama TV series starring Trevor Eve as Eddie Shoestring, Doran Godwin playing Erica Bayliss, Michael Medwin as Don Satchley, and Liz Crowther as Sonya in the main roles. The show is set in the West Country, as a radio-phone-in detective Eddie Shoestring (Trevor Eve) tries to solve the multitude of cases that get thrown his way. Trevor Eve, Michael Medwin, Doran Godwin, William Russell, Madoline Thomas, Liz Crowther, Michael Culver, Stacy Dorning, Bridget Brice, Kenneth Gilbert, Oscar James, Sally Sanders, David Beale, Sean Arnold, Brian Miller, Maggie Riley, et al. 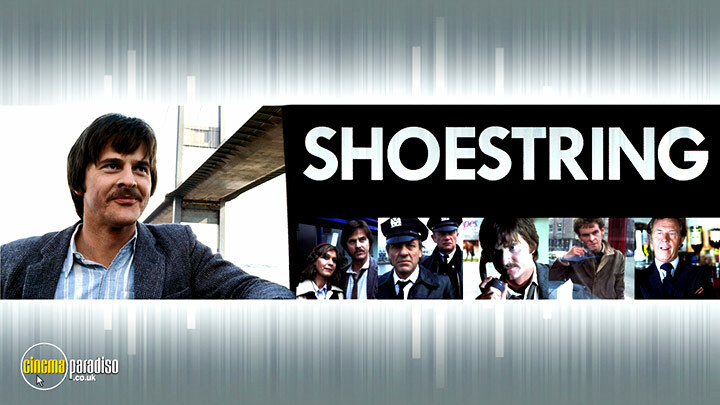 First broadcast in 1979, 'Shoestring' became one of the most popular British private detective shows of all time, with Trevor Eve playing the dishevelled radio detective Eddie Shoestring. Eddie is an unconventional and unlikely private eye. In fact, with his own phone-in radio show, he's more like a troubleshooting private ear. His scruffy clothes, shaggy hairstyle and off-centre view of life offer him a clever and deceptive camouflage when he's on the crime-solving trail. His listeners' appeals include grisly pranks at a prep school, a missing punk rocker and a victim of a predatory cult. Eddie's quest for justice leads him into some dangerous scrapes - and some funny ones, in investigations full of twists and surprises.